Charles Hepworth will share his views on the outcome of the EU Referendum, assessing the likely impact on the markets and explaining how it will inform asset allocation decisions within GAM Model Portfolios. Uncertainty reigns in Europe. Investor flows are negative, the political environment is volatile and financial markets appear to be pricing in a recession. In this webcast Niall Gallagher, Investment Director of the GAM Star Continental European Equity and GAM Star European Equity funds, will explain why he remains more positive on European growth and equity markets than the majority opinion. Register for the webcast to find out more and pose your questions to Niall. In this webcast Tim Love, Investment Director for Emerging Market equities, will assess the outlook for his asset class and explain why he foresees both a valuation and multiple uplift. Register for the webcast to find out more and pose your questions to Tim. Gregoire Mivelaz, portfolio manager of the GAM Star Credit Opportunities funds, will consider the current environment for bond investing and provide an insight into the funds’ performance and positioning. Register for the webcast to find out more and pose your questions to Gregoire. Despite near-term risks to growth, EM fundamentals and technical factors appear supportive. How can investors capitalise? Paul McNamara, Investment Director of GAM’s Local Emerging Bond strategy, will outline why he believes the asset class is oversold and under-owned and now offers a compelling entry level to investors. He will also review the macroeconomic backdrop, pick out some of the winners and losers at a country level and reveal how he is positioning his portfolio accordingly. Register for the webcast to find out more and pose your questions to Paul. Economic fundamentals are reasserting themselves as market drivers after a prolonged period of “mispricing” driven by unconventional policies. This is creating headwinds for traditional asset classes and leading investors to look elsewhere for returns. Adrian Owens, Investment Director of the GAM Global Rates Strategy, will outline the historically stretched opportunities he sees in the rates and currency markets in this environment. He will also touch on the importance of liquidity as monetary policy tightens. Register for the webcast to find out more and pose your questions to Adrian. Gregoire Mivelaz, portfolio manager of the GAM Star Fund plc – GAM Star Credit Opportunities GBP Fund, will consider the current environment for bond investing and provide an insight into the fund's performance and positioning. Join Charles Hepworth, Investment Director for GAM’s Model Portfolio Service, as he considers the prospects for 2019. Register for the webcast to find out more and pose your questions to Charles. The GAM UK Equity Income Fund launched a little over one year ago. With a successful first year under their belt, fund managers Adrian Gosden and Chris Morrison introduce themselves, outline how they work together and explain how they see the UK Equity Income space. In a crowded marketplace, it pays to stand out. Find out how the GAM UK Equity Fund achieves this. One year has passed since the launch of the GAM UK Equity Income Fund. Over a challenging and volatile first year, the fund delivered top quartile performance and comfortably outperformed the FTSE All Share index. Fund managers Adrian Gosden and Chris Morrison review a turbulent year where a nimble approach was vital. There are several investments in their top 10 holdings that did not exist in the portfolio 12 months ago. Find out how their active approach helped them keep ahead of the pack. One year has passed since the launch of the GAM UK Equity Income Fund. Over a challenging and volatile first year, the fund delivered top decile performance and comfortably outperformed the FTSE All Share index. As the domestic economy approaches an inflection point, fund managers Adrian Gosden and Chris Morrison assess how stocks might fare in this environment. One thing is certain: volatility brings opportunity for good stock pickers. When the uncertainty clouding the UK market lifts, they hope to look back and see how obvious a buying opportunity this was. Over the summer, a significant overweight exposure to US equities would have benefitted portfolios. Join Charles Hepworth, Investment Director for GAM’s Model Portfolio Service, as he outlines why he takes a more global view and how that should benefits investors in the long run. Charles will also touch on deal versus no-deal Brexit, trade wars and the portfolios’ latest performance and positioning. Mortgage-Backed Securities (MBS) account for almost a quarter of the US fixed income market, second only to Treasuries. Tom Mansley, Investment Director of the GAM Star MBS Total Return Fund, will explain how a judicious exposure to MBS can offer an attractive yield, with high credit quality and low liquidity risk. In the current low-yield environment MBS can be a useful diversifier and source of significantly higher yields than Treasuries with similar maturities, and Tom will outline his latest views and positioning. Register for the webcast to find out more and pose your questions to Tom. Trade wars, monetary policy, stretched valuations. The current investment landscape warrants a certain degree of caution. 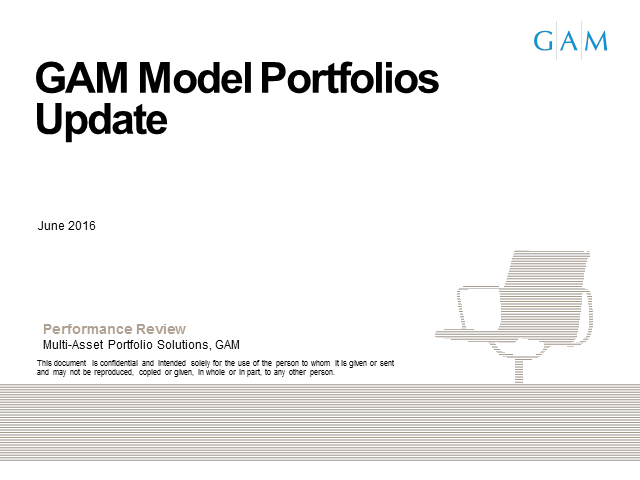 Join Charles Hepworth, Investment Director for GAM’s Model Portfolio Service, as he outlines the asset allocation calls he is making in this environment and how that is reflected in performance. Register for the webcast to find out more about positioning, performance and to pose your questions to Charles. 2017 was another strong year for European equities. After several years of strong returns it is worth asking whether the best of the stock market’s returns this cycle are behind us. Investment Director Niall Gallagher argues that the answer to this question for European equities is a resounding “no”. -The positive news for European equities is that earnings are now beginning to grow again in Europe with double digit earnings growth forecast for the MSCI Europe index for 2018. Construction output, too, has visibly turned positive. -The next leg of returns and potentially the ‘catch up’ trade with US equities should be earnings driven. Niall remains extremely positive and believes there is still significant upside for the asset class. Paul McNamara talks to financial journalist Cherry Raynard about how he thinks about emerging market debt investing and what well-managed exposure to the asset class can add to investor portfolios. With losses over $100 billion, 2017 was one of the worst years for insured disasters in recent history. Three major hurricanes in quick succession – Hurricanes Harvey, Irma and Maria – wreaked havoc and highlighted the insurance “disaster gap”. Dr John Seo, one of the leading investors in the highly specialised field of Insurance-Linked Securities (ILS), will look at how the events of 2017 have reinforced the importance of the asset class. In an increasingly correlated world, a well-managed ILS allocation can offer investors a genuine a source of diversification. Find out how. * EM equity is at its highest dispersion for ten years, how can investors stay on top? * What are the bear traps to avoid in a maturing EM debt rally? * Is EM downside risk now in line with (or perhaps even lower than) DM? Our regular online sessions will include fund manager presentations, portfolio overviews and investment updates.